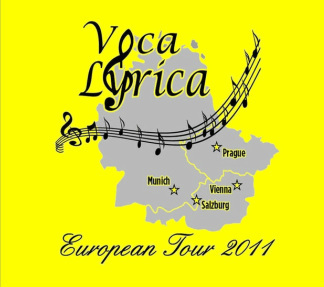 It was a trip that was years in the making, and if you ask any of the singers of Voca Lyrica, or the friends, siblings and spouses who accompanied us in June 2011, we would all do it again in a heartbeat. Those who have been fortunate enough to travel to Europe will understand. And on top of all the “touristing” we did, we also made some incredibly beautiful music along the way. Our visit to Prague began with a strike, a transit strike that is. But since we had our own bus, driver, and guide, we were not affected by it at all. The strike only lasted one day, our first full day in Prague; the following day things were back to normal. We did get to see some of the highlights of Prague’s Old Town, had our first concert venue pointed out, and at lunch many of us had our first experience with Becherovka, a Czech liqueur created from a proprietary assortment of herbs. It defies description. Our three days in Prague included two concerts, the first in St Nicholas Church in Old Town, our first experience with the acoustic challenges presented by these beautiful old structures. The second “concert” was actually a participation in a Catholic mass at St. Mary of the Snows, where we sang four hymns for the mass, and the congregation sang the rest….in Czech. We had a memorable visit to the Jewish Quarter, a lunchtime boat cruise on the Vlatva River, a visit to Prague Castle, a walk across the historic Charles Bridge, a rollicking medieval theme dinner at U Pavuka, several people attended the opera, others enjoyed the National Marionette Theater, and nearly everyone made donations to the local economy by shopping. Saying farewell to our Prague guide Martina, we boarded the bus and departed for our first Austrian destination, Vienna. We actually stayed outside Vienna in Mödling, a wine village, much different from the hustle and bustle of Prague. We had a whirlwind walking tour of central Vienna with our local guide Rudy, who proudly pointed out many beautiful and historic buildings and gave us several suggestions on what to do/see during our free afternoon. Many chose to visit the Kaisergruft, the burial place of the Hapsburgs, others viewed the crown jewels at the castle, and then enjoyed a sidewalk café stop for coffee and pastry. Our concert that evening was at Peterskirsche, the site of the second oldest church in all of Vienna. Afterwards, many from the group “wound down” from the day by walking to a local café for a wine tasting. And the next morning it was off to Salzburg. On the way, we stopped to visit the St. Florian Abbey, which sponsored a famous boys choir even before the Vienna Boys Choir and where, to our delight we were invited to sing twice, once in the beautiful marble reception hall, and then again in the chapel itself, which houses the famous Bruckner organ, which was being played for a music class. How amazing! After a stop in Mondsee, to visit the church where the “Sound of Music” wedding was filmed, and where we were again allowed to sing, we finally arrived in Salzburg, the birthplace of Mozart. Here our hotel was right downtown, so we were within walking distance of many venues, including the Mozart house. Our local guide, Manfred, led us efficiently around to the high points during the morning, and the afternoon was spent visiting sites from the filming of “The Sound of Music.” We endured a thunderstorm with large hail on the way back to the hotel and, after dinner, sang our final official concert in Europe at the Christuskirche, the oldest Protestant church in Salzburg. Instead of being accompanied by an electronic piano, this performance featured a Bosendorfer grand piano, a real treat for our accompanist, Ann Applegate. On our way to Munich, our final European destination, we stopped at Oberndorf, the site of the chapel where “Silent Night” was first performed. It was here that we finally took our “Pioneer picture.” Then it was on to Munich, which is famous for many things, including Nymphenburg, the summer palace of Ludwig II, a huge farmers market, and a world-famous glockenspiel, but it is also the home of the Hofbräu House, one of Munich’s oldest breweries, where the beer was enjoyed by most and a good time was enjoyed by all. Of all the sights, sounds and highlights that Voca Lyrica experienced during our recent trip to Europe, without a doubt the one that most moved us all was our trip to Dachau where we sang what was termed an informal concert at the Protestant chapel there. It was our last full day in Europe. We had performed four formal concerts and had several other unscheduled singing opportunities. But none of that prepared us for the emotional event that transpired on June 24. Voca Lyrica has sung in Carnegie Hall and the Sydney Opera House. We have sung at a member’s wedding, and we have sung at several memorial services. And over the past eight days we had sung in several of the oldest, most beautiful churches in Prague, Vienna and Salzburg. But Dachau was a venue that you simply couldn’t prepare for….not until you were there. We had talked about this concert/presentation for months, with women expressing their doubts and anxieties over how the sense of place could overwhelm us emotionally. We had practiced our music until we knew it even in our sleep. And then we got off the bus. It was, as I recall, a sunny day. The sky was blue; there were puffy white clouds, and yes, there were birds singing. But as we walked all the way from the parking area at the front of the site, past the building which houses the theater and displays, past the remaining barrack building, maintained to show the world what conditions were like, past the footprints of the seemingly interminable number of other barrack buildings (each one built to house 200 prisoners, but filled beyond capacity to house nearly 2000 near the end), the atmosphere seemed almost oppressive, the whispers of the past almost audible. How does one sing with all of this invisibly swirling about? We entered the chapel, one of three religious structures erected after the war at the back of the camp site. We were scheduled to sing in the Protestant chapel; there are three others, a Russian Orthodox chapel, a Catholic chapel and a Jewish memorial. Political prisoners and members of the clergy as well as Jews were imprisoned in Dachau; the memorial site seeks to include all of them. The chapel is a simple concrete building, starkly simple outside and in, and once inside, we gathered ourselves together and prepared to sing. I doubt that any of us will ever forget that day, just as the rest of humanity needs to be reminded by this site and the other concentration camp sites as well….never forget.